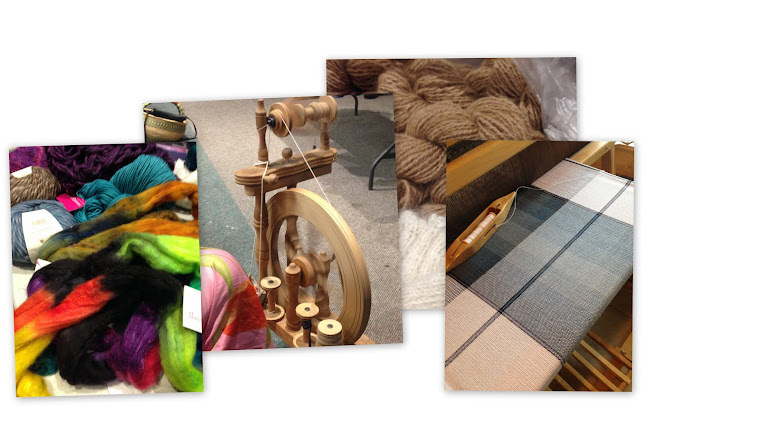 Deep Cove Weavers and Spinners Guild: Welcome to the first posting on our new site. Welcome to the first posting on our new site. 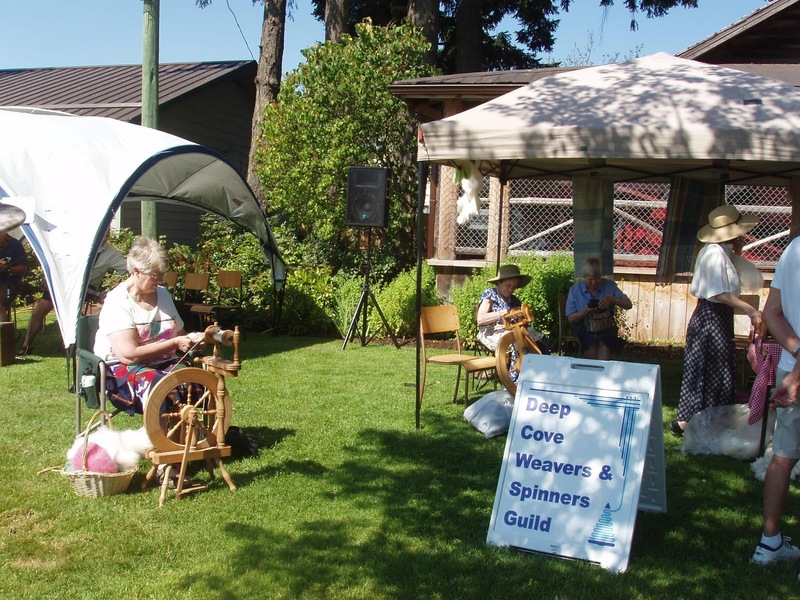 The DCWS Guild members have been busy out and about in the Community this summer. We were invited to the Deep Cove School’s 100thAnniversary the last week in June. It was fun to see the faces of the children as they participated in demonstrations of Carding, Drop Spindle, Spinning Wheel, Inkle Loom, Table Looms, Needle Felting and making Rope. We were a tired group after repeating the demos to several classes from Kindergarten to Grade 5. Saturday July 20th a few of our members could be seen at the Heritage Fair in Pioneer Park. 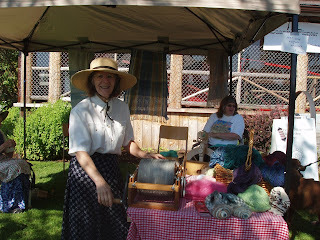 A nice sunny day brought lots of people out to see demonstrations of the carder, drop spindle and spinning wheels. 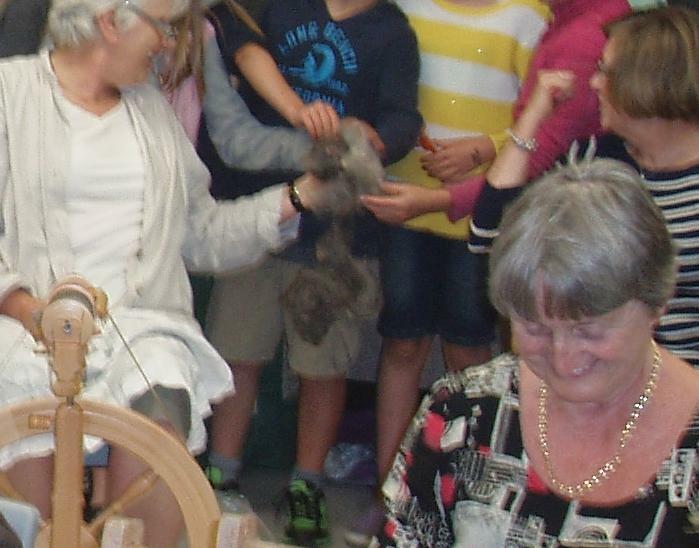 Spinning with dog hair is always a good conversation starter. A ‘Spin Off ‘ group of the DCWS meets regularly outside the CACSP Art Gallery at Tulista Park on Tuesdays (10-12). There are always people stopping to see the wheels spinning and chat with our colourful group. Drop by and see what we are up to. Don’t Spin? Bring your knitting and join us for the morning.